The story of a movement far bigger than sport. The inaugural season of the AFL Women's League was a game-changer for Australian sport, and for Australia culturally. When the nation's biggest, richest and most popular sporting code decided to include women like never before, it ga... read full description below. The story of a movement far bigger than sport. The inaugural season of the AFL Women's League was a game-changer for Australian sport, and for Australia culturally. When the nation's biggest, richest and most popular sporting code decided to include women like never before, it gave them licence to become true football heroes. 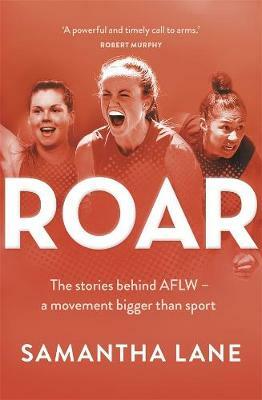 With unique opening insights from award-winning journalist Samantha Lane, including previously untold details of how the AFLW came to being, Roar features a wide range of profiles from the most compelling characters in the game. These include the league's original poster-player, Daisy Pearce; Craig Starcevich, the Collingwood premiership footballer who has found happiness where he least expected it; the transformed Sarah Perkins; richly talented Tayla Harris and Katie Brennan; the first openly gay AFLW couple Penny Cula-Reid and Mia-Rae Clifford; and history-making premiership coach Bec Goddard. All share intimate details of their remarkable paths to this seminal moment in history. Roar is a groundbreaking book to inspire, illuminate and ultimately celebrate the leading lights of the AFLW. An award-winning journalist specialising in Australian Rules Football, Olympics and cycling, Samantha Lane has been a member of Channel Seven's AFL television broadcast team since 2013. The move followed ten years on Channel 10's much-loved AFL show Before the Game. Sam's 12 years writing for The Age and Fairfax Media was highlight filled. She is a two-time Quill award winner from the Melbourne Press Club, and her work on the AFL and NRL doping scandals formed part of a Fairfax group entry that won a Walkley award. She has covered the Olympic Games and the Tour de France three times, and her work on the AFL women's league has been pioneering. She was co-host of Channel Seven's AFLW pre-match show in its inaugural season and was boundary rider for all of Channel Seven's AFLW game broadcasts, including the landmark first AFLW grand final.